The above vacancies would first be filled up with Experienced Cabin Crew and the residual vacancies would be filled by Trainee Cabin Crew. Candidates are advised to STRICLTY apply for the post as per category as indicated above. The reservation for above vacancies has been calculated keeping in view the earlier advertisements issued and the vacancies filled and also in terms of guidelines issued on reservation of vacancies by the Government of India from time to time. Note: Please note that candidates, who have undergone Lasik surgery for correction of eyesight, will be considered provided they have undergone surgery prior to six months of the date of eligibility criteria. -Clear complexion without any noticeably blemish, no odd scars/ birth mark. -Fluency in English and Hindi. -Candidates having fluency in any Foreign Language of destination where Air India operates will be given preference. Candidates who fulfil the above eligibility criteria for the post of Trainee Cabin Crew will be required to apply online. Eligible candidates will be subject to appear for Preliminary Medical Examination consisting of Height and BMI check followed by a Group Dynamics & Personality Assessment Test (GD&PAT) at the venue as decided by Air India Limited. GD & PAT shall be conducted in phases and candidates who qualify the same and fall in the applicable zone of consideration, will be required to appear for a Written Test. Interested candidates, who fulfill the above requirements, may apply ONLINE (ONLY). Candidates who wish to apply, are advised to log on to the Career Page of our Website www.airindia.in and fill in the Online Application Format. therein the date on which, they have undergone lasik surgery as the same will be required while filling the Online Application Form. Such candidates will be required to bring the said Medical Certificate/s in original at the time of appearing for Selection Process. Note: All correspondence would be made ONLINE with the candidates. Eligible candidates would be required to bring photocopies of testimonials in support of their Date of birth, Qualification, Experience, Caste and Medical Certificate(s) along with Originals. Candidates would also be required to bring Demand Draft (if applicable) & domicile proof (if claiming relaxation in height) at the time of appearing for selection exercise. Candidates, who fulfill the above eligibility criteria and are employed in Government/Semi Government/Public Sector Undertakings, may also apply Online. Such candidates will be required to bring a “No Objection Certificate” from their employer at the time of appearing for selection exercise. 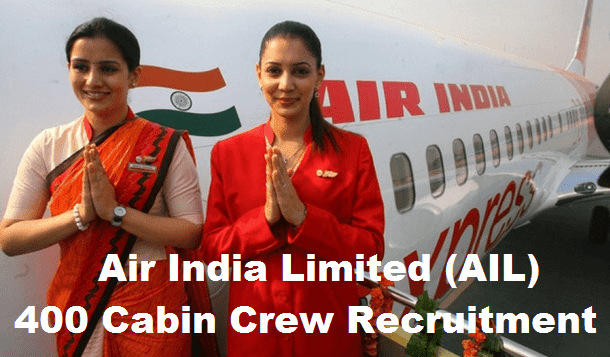 (1) Please note that the candidature of Cabin Crew presently working with any of the subsidiaries Companies of Air India Ltd will not be considered. (2) No Physical Application will be entertained under any circumstances.